Most of us know that February 14th is the Valentine’s Day. But did you know August 28th is Chinese Valentine’s Day? Like the Western’s Valentine’s Day, there is a very sweet yet sad love story behind the Chinese Valentine’s day as well. I’m going to explain everything you need to know about the Chinese Valentine’s Day, starting from the stars, the legend, and the traditions. If you’re curious about the differences between the Chinese and Western Valentine’s Day, keep on reading. 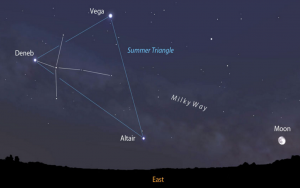 Have you ever noticed the Summer Triangle? 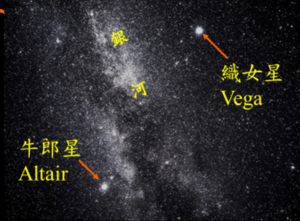 The Vega star is actually the representative of the weaver girl “织女 – Zhī nǚ” and the Altair star is the Cowherd “牛郎 – Niú láng”. Between these two stars, there is the Milky Way, which is called “ 银河 – yín hé ” in the Chinese language. It divides the two lovers as seen in the photo. The Deneb constellation actually represents the magpie and forms the bridge for the two lovers to meet. 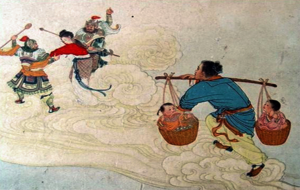 This is a very famous Chinese folklore that most parents told their children. 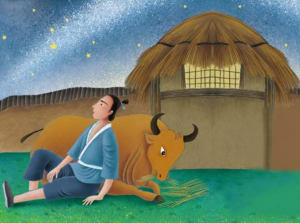 The story versions may differ depending on families, but the main core is about the deep love between the Cowherd “牛郎 – Niú láng” and the weaver girl “织女 – Zhī nǚ”. I’ll tell you the version that my grandmother used to tell me. The weaver girl, the 7th daughter of the Jade Emperor. If you have read about Taoist temples, you would’ve known who’s the Jade Emperor. This 7th daughter is very skillful in weaving. Legend has it that the weaver girl weaves all the beautiful clouds and rainbows. She is the Vega star. Then, she falls in love with the Cowherd who is the Altair star. Unfortunately, the Emperor’s mother (the weaver girl’s grandmother) found out about their love and was very furious. She punished the Altair star by sending him to earth. On earth, the cowherd was born into a poor family. When his parents died, he had to live with his brother and his brother’s wife. Both of them were very mean to the cowherd. Afterwards, they even kicked the cowherd out, leaving him with just one cow. The cowherd had no choice but to leave with the cow. He and the cow depended on each other. They became best friends and they worked really hard to build a house and a farm. Meanwhile, the weaver girl wasn’t happy in the heavens either. She just wove and wove all day just to escape her sadness. Her sisters pitied her, so they asked permission from their grandmother for all of them to go to earth bathing in the lotus garden. To their surprise, they got the permission. The cowherd’s cow is also not an ordinary cow. He was actually the cow of the Taurus sign and also a close friend with Altair while they were in the heavens. He got banished from the heavens for asking the grandmother queen to spare the Altair. Once he knows the fairies are coming down to the Earth, he told the cowherd to go and steal the weaver girl’s clothes while they were bathing.The cowherd did as he was told. When it was time to go back to the heavens, all the other fairies flew back to the heavens. Only the weaver girl is left because she didn’t have her clothes. 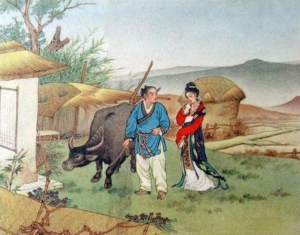 When the cowherd saw the weaver girl, he fell in love with her immediately even though he didn’t remember her. He asked her to marry him and become his wife.The weaver girl immediately realized the cowherd who was asking for her hand is none other than her lover Altair. She was very happy to reunite with him and agreed to marry him in no time. The two soon got married and had a son and a daughter. The cowherd boy continued plowing the land and the wife weaving the cotton. Although they were not wealthy, they were very happy together. However, their happiness did not last. The cow, the cowherd boy’s best friend, died. Before he died, the cow told the cowherd boy to take his cowhide to make a coat so that the cowherd could fly when the time comes. It didn’t take long for the cow’s predictions to come true. Soon the grandmother Queen found out the weaver girl was missing. She sent the soldiers to bring her back straight away. The cowherd wore the coat made of cowhide, put his children in the two baskets and carry them across his shoulder. He then flew up to catch his wife. When he got closer, the queen mother put her hairpin between them. This hairpin becomes a silver river “Milky Way (银河 – yín hé )” between Vega and Altair. Once again the two lovers were separated. They had no choice but to cry and long for each other from each side of the river. The weaver girl has to go back to weave clouds and the rainbows. But she was so heartbroken, she missed her husband and the children so badly. Even the clouds and the rainbows she wove seemed sad. The Magpies heard their sorrow and took pity on the two lovers. They flew over from all over the world to form a bridge for the two lovers. The fact is that Cygnus constellation looks just like a magpie. Their love also moved the Grandmother Queen and she allowed them to meet on every 7th night of the 7th month in Chinese lunar calendar. Well, actually Chinese believe that one day in the heavens is actually 7 years on earth. That’s why it took long enough for the couple to have children on earth. But since they are back in the heavens now, hopefully, once a year of earth time is not too long for them. 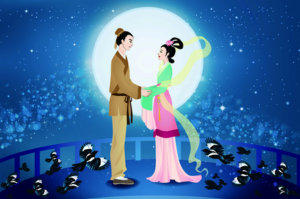 What to do on Qixi festival? In the past, weaving was of the basic skills that girls must have in order to get a good husband. Therefore, on this day, the girls would offer the weaver girl various offerings and ask for weaving tips. 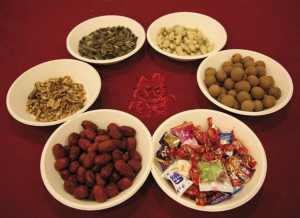 The offerings were quite similar to that of Chinese New Year traditions. The couple would pray them, hoping their love would be as strong as Niulang and Zhinü. But nowadays, Chinese people celebrate this day just like the Western Valentine’s Day. They will give gifts to their partners and spend time together. Even if you don’t believe in Niulang and Zhinü legends, it is always good to make your significant lover happy by spending time together. Singles also use this day as an opportunity to express their love “告白 – gàobái” to their crush. Here’s a few pick up lines in Chinese if you planning for one! So, August 28th is the 7th day of 7th month in the Chinese lunar calendar. Meaning it’s time for Niulang and Zhinü to meet and also it’s Chinese Valentine’s Day. Niulang and Zhinü love each other very much, but their journey is not a smooth one. They never stop loving each other no matter how difficult the situation. We should celebrate this day together with our lovers to acknowledge their love and share your happiness. I’m sure this will be a good excuse to celebrate with your lover even if you are not Chinese. Sam works as CMO of TutorMandarin – an online learn Chinese tutor service that focuses on teaching students how to speak Chinese using an innovative learn Chinese app and PC Software. The app is free to download and comes with a free 1-on-1 class, 2 unlocked courses, a full language evaluation, and daily Chinese articles. Sam has lived in China for 5-6 years in Beijing and Suzhou as well as Taipei for over a year. He has been studying the Chinese language and Chinese culture even longer.